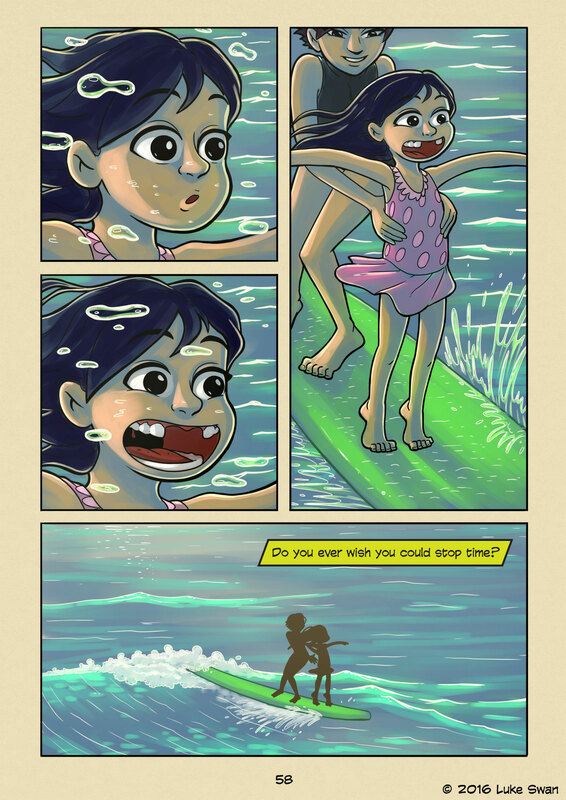 Stopping Time (#058) | Web comic "Surfer Joe"
We’ve all experienced those moments in time. Blissfully perfect. So perfect in fact that if we were to stop time in that moment, we would be happy forever. But then the moment passes, and we are left searching for the next one. The act of surfing encapsulates this like no other activity. Surfing is hard work, mostly paddling really. The act of just catching a wave is a test of power, endurance, the mind and your nerve. But if you make the takeoff, then the payoff is sweet. Some might say perfection. And once the wave is finished you are left in the shallow water. Time to paddle out again, through the pounding surf. The whole point of surfing is to chase moments of perfection. Every wave is another rep, an opportunity to get it right. It takes a certain type of person to pursue something as difficult to achieve. Most other activities are simple enough that people can casually enjoy them. The basics of surfing are more obtuse, and what you end up doing is not as advertised by surf magazines and videos. Because before you can surf, you need to learn to paddle. And paddling is not easy. I’m seeing a pattern here. These moments we so wish we could freeze time seem to come with hard work, followed by achievement. Of course, the feeling is fleeting, and so we work on the next achievement. And we keep chasing it. Over and over. Until the end of our time.